I have written on these pages many times about the importance and benefits of excluding livestock from riparian areas. But we cannot exclude livestock from these areas and just walk away. Management of riparian buffers is vital for not only the quality of wildlife habitat but for the acceptance of this practice in the community. Tree shelter maintenance, vole control, and invasive species control are all vital management strategies for a successful riparian buffer. This post is about invasive plant control and highlights some of the native plants thriving in our riparian buffers. 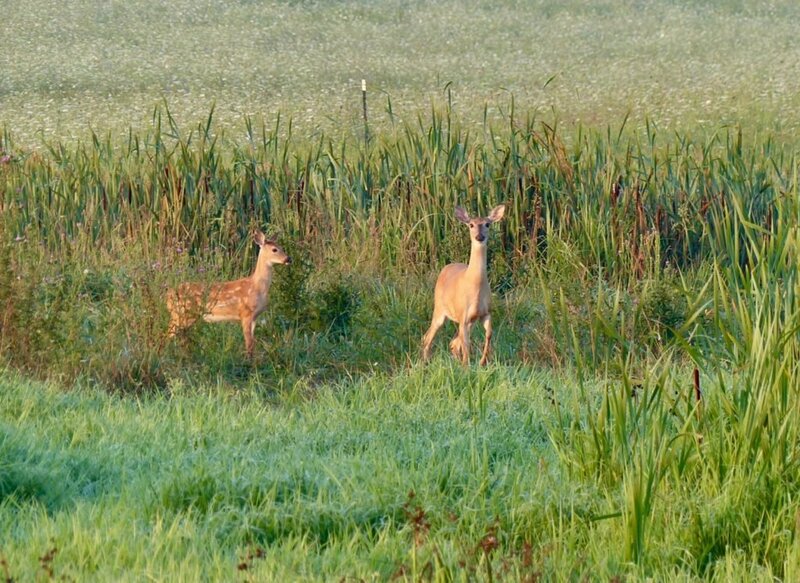 One of the wetland wildlife areas on the farm. Native cattails are in the foreground. We didn’t have to plant these…they will come on their own. Nothing unsells riparian buffer programs quicker than an area full of invasive species. Quite frankly, it turns farmers off. We must do a better job of managing riparian areas. We fight invasives year-round. Musk thistle, Canada thistle, bull thistle, carpetweed, teasel, and cocklebur are the main ones we have in our riparian buffers here in Swoope. There are many others including tall fescue, autumn olive, Japanese knotweed, Japanese hops, multi-flora rose, creeping Charlie, prickly lettuce, Bradford pear, tree of heaven, and wineberry. We use hoes, mowers, herbicides, and hand pulling as necessary to suppress their growth. Jeanne and I spent a couple hours the other day in one of her mother’s fields where we fenced the cows out of a pond and wetland. Our job was to cut the seed heads off of Bull Thistles and then cut the plant down. It was too late to use a herbicide, that’s why we were cutting the seed heads off. We cut the seed heads off the plant to prevent the seeds from reproducing. After we cut them off we put them in a container and transported it to a burn pile. Bull thistles have very long thorns that will readily go through leather gloves; we had to wear two pairs of gloves to complete the task. Bull thistle seed heads ready for the burn pile. Bull thistle, Cirsium vlagare is a biennial and native to Europe, Western Asia, and Northeastern Africa. Hard to believe but it’s the national flower of Scotland. Although the plant is not native here and is invasive, American Goldfinches eat the seeds and use them for nesting material. Butterflies, moths, and flies seek its nectar and pollen. But, it does spread, taking the space other more beneficial plants could have and it’s offensive to farmers. So, we take it out. As we worked I was amazed at all the native plants and pollinators. This particular riparian area was full of butterfly weed, Asclepias incarnata which attracts many pollinators; it’s in the milkweed family. Butterfly weed is native to the Eastern United States. Another native plant in bloom this time of year is Purpletop, Tridens flavus. 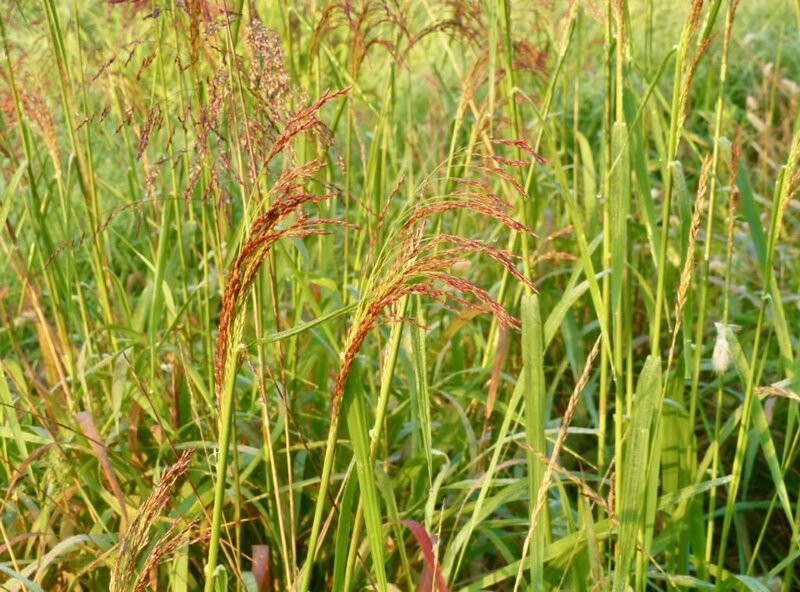 This perennial warm-season grass is also known as grease grass because the seeds are oily. Purpletop is a native perennial grass in Eastern US and blooms during late summer. Riparian areas are also great places to let Common Milkweed, Asclepias syriaca prosper. We trim a portion of milkweed in riparian areas in July so it will re-sprout with tender leaves. Monarch’s are more attracted to the tender leaves than the older, tougher leaves. 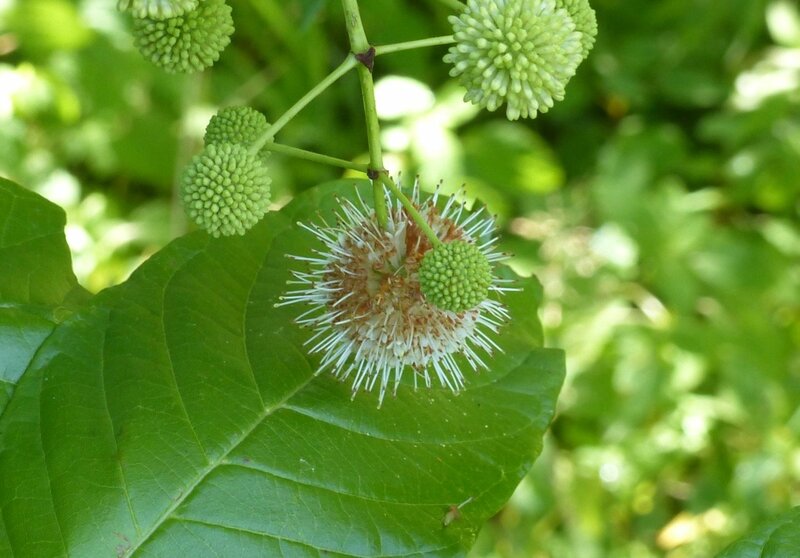 One of our favorite riparian shrubs is Button Bush, Celphalanthus occidentalis. 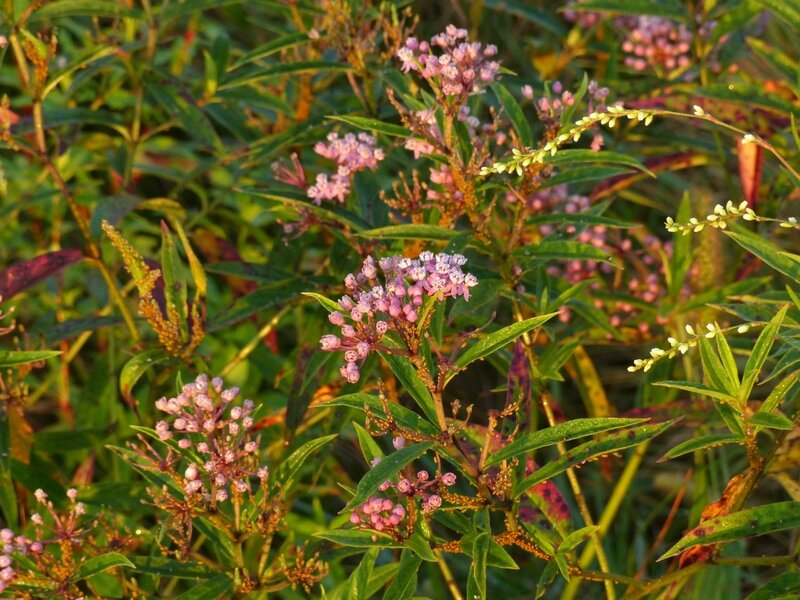 Button Bush is native to Eastern US and is in the coffee family. Riparian buffers help improve water quality in our streams and wetlands. 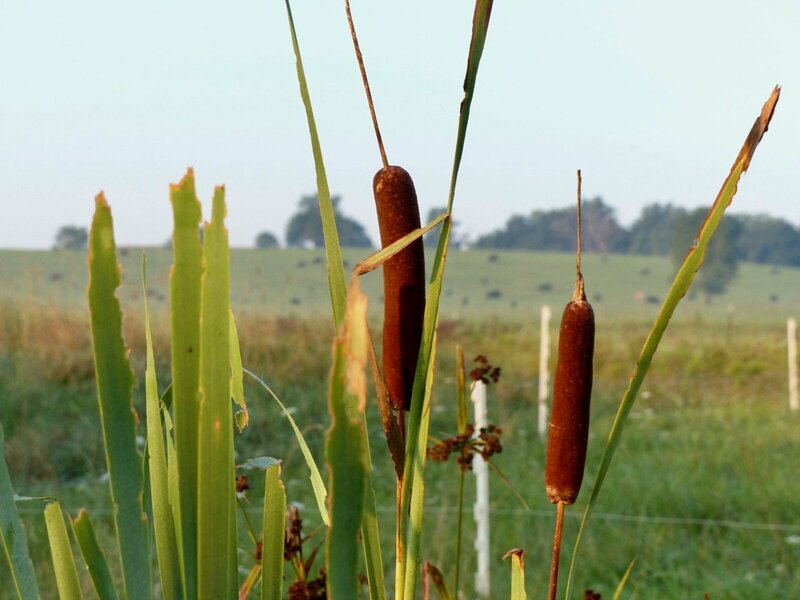 These buffers are vital for restoring stream health and the Chesapeake Bay. They also are the best landscapes for wildlife because they provide food, shelter, and water. To be successful though we must control invasive species and let native plants prosper. Riparian buffers are excellent wildlife habitats because they provide food, shelter and water. To learn more explore my website, send me a message or contact your local Soil and Water Conservation District, USDA office or any of the organizations in the resources tab on this site. Lovely and informative article. thanks for the photos. We live on a ridge just inside the Alleghenies in nw Rock’ham county. The soil is thin and acidic. We have very few wildflowers in the old hay fields and – once overgrazed but now left alone – surrounding woods. Thistle grows here and abundant milkweed, which resprouts after hay harvest in early summer. The thistle as you say, provides food for goldfinches and butterflies. 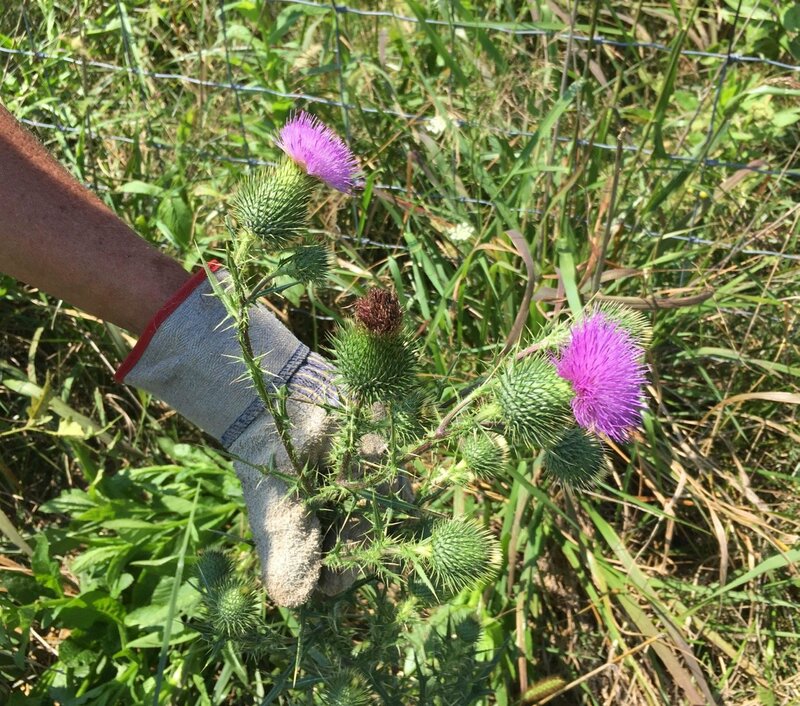 I keep planting, mostly in our yard,, but leave some thistles beyond the perimeter so the fall foragers will find food. I planted 40 trees wildlife-food-types. How do you maintain them? I can’t carry water to them so rely on rainfall. when they grow through the tops of the tubes, the deer chomp them off. Thanks for your comment Nancy. You could tape another shelter on top of the existing one. Also, there are some varieties that deer don’t like such as Sycamore and False Indigo Bush. I have had reasonably good luck spraying deer repellent on the leaves that pop out of the top of the tree tubes. Unfortunately, you have to do it several times during the growing season. You have a wonderful diversity of native plants! Here in Fluvanna, one of the invasive plants we struggle with is serecia lespedeza. And Autumn Olive is spreading rapidly because birds eat the fruit and spread it. But, it’s not as hard to kill as I feared. I cut it down and spray the stumps. Then, if it lives, I spray the shoots each spring, before the leaves get waxy and resistant to the spray. Some die after the first treatment. Others take two or three treatments. If you let it go, it crowds out other edge species, even trees like dogwoods and redbuds. And in some parts of western Virginia, it has taken over fields. It would help if the Va. Dept. of Transportation would declare war on it. Much of its spread from Southwest Virginia has occurred along I-81, 1-64, and other highways. Overton, thanks so much for your comments and hard work. I am so glad you have quail! I would like to know what Overton sprays with. Roundup has been linked to Parkinson’s Disease. Is there ANY herbicide safe to use, as in human exposure? Nancy, I do not know what Overton uses. I do not believe there is any herbicide safe to use as in human exposure…We do use herbicides in our riparian areas but only as a spot spray to the selected plant. In the past, we have used Roundup on Autumn Olive. I am open to other suggestions. Perhaps we should cut the stumps off fairly level and try killing them with salt. Another option might be Rodeo. I believe it does not have POEA, the ingredient in Roundup that is suspected of harming humans and fish. This is a great blog piece! I have sent it to my friends at the Virginia Native Plant Society. 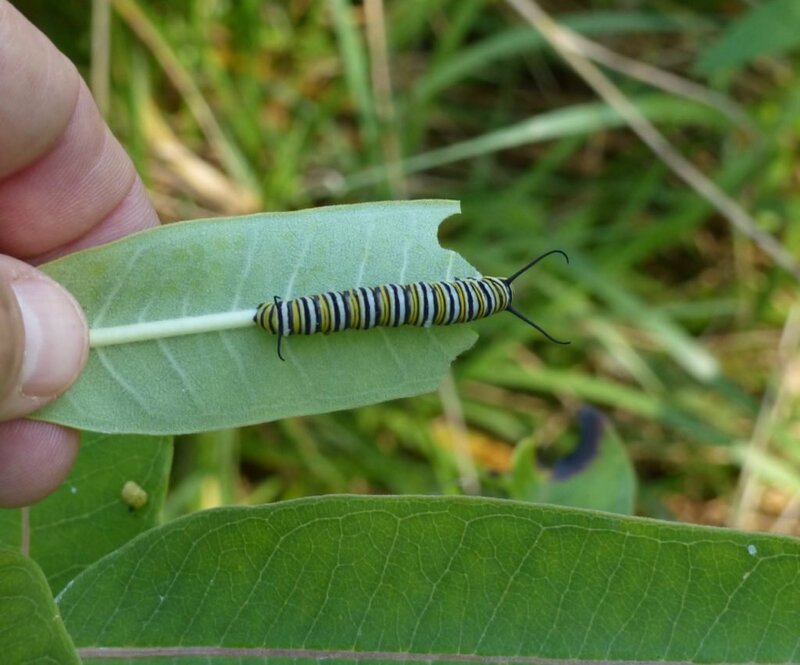 I am so impressed that you cut back your common milkweed in July and now are having nice young tender leaves for monarch caterpillars…great picture of the cat on a tasty young leaf! A significant contribution towards saving the monarch migration. Your lovely Asclepias incarnata pic was a little puzzeling to me as A. incarnata actually goes by the common name “Swamp Millkweed” and it does love wet areas. Butterfly weed has orange flowers and is Asclepias tuberosa. Your picture looks to have the pretty pink flowers of A. incarnata, but teh leaves look more similar to those of A. tubersoa….but hard to tell. Both are native and terrific plants in riparian areas….it might be the light. Thank you and Jeanne for the wonderful work you are doing! Marie, thanks for commenting. Ha! I did have the Asclepias as tuberosa to begin with and a reader corrected me…I thought. He insisted it was incarnata. I’ll have to dig a little deeper into this. a muck hole. Fine work, neighbor, and much appreciated. Great article! Bobby, I took the course on Riparian Restoration at SCBI a few years ago, which is how learned about your blog. Which herbicide(s) do you use? How did you plant the natives- seed, plugs, gallons? In NW DC / Maryland the biggest problem is porcelainberry. It’s my understanding that the invasives need to be removed completely or natives won’t be successful, especially in sunny areas. We’ve had more success with native seed stock returning in the forest. Jane, thanks for your kind words. We have planted seeds, bare root seedlings and plugs. Most of the natives have just come on their own such as goldenrod, wingstem and jewelweed. We did plant the native grasses. Curley Charlie, any way to control it? Good article, as always. Thanks Logan, good to hear from you and thanks for the tip on the gloves. The summer between my sophomore and junior year of college I interned on a farm where I worked on invasive species removal. We actually worked towards removing thistle. 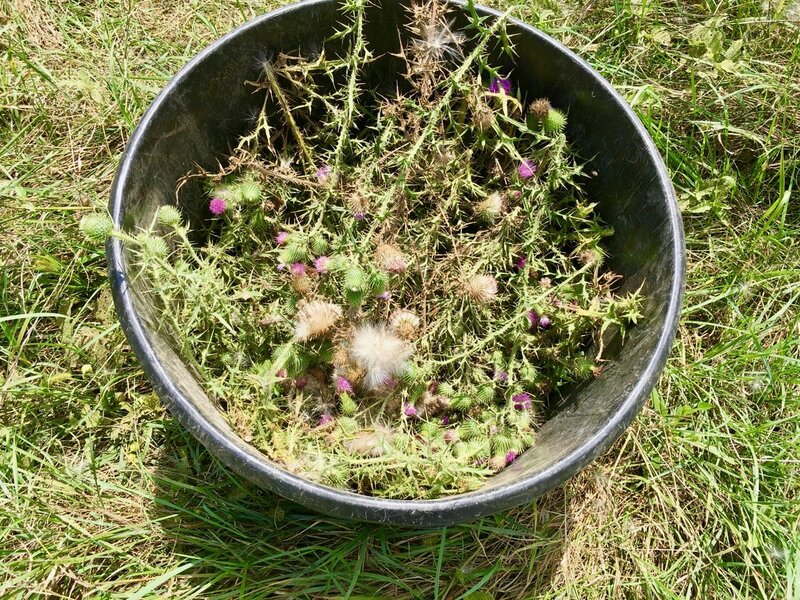 The thistle that didn’t get sprayed, we had to go through and do the same seed removal process. The process is very difficult and it is hard not to get poked by the thorns! Invasive species removal seems to never end and is a constant battle for all those managing lands, but the work is important and much needed to keep healthy, diverse ecosystems. The hard work required to remove invasive species is necessary for maintaining habitats. Improving the riparian buffer habitats is a great way to improve water quality and is a very important BMP. I chose this particular blog post because it parallels many of the things that we discuss in class. For example, excluding livestock from water resources is very important in maintaining the health of the aquatic ecosystems in that waterway. We discussed in class that fencing off cows helps maintain clean drinking water for towns/cities down the “water chain”, they also promote the growth of native plant species via riparian buffers. Though, as we saw when we were removing invasive species like burr cucumber, maintaining these buffers requires work. Through this article it was also cool to learn and see pictures of native plant species in the Shenandoah valley area because I am not an ISAT major and not usually exposed to local species identification.